Teachers at Wellington Seventh-day Adventist School are intentional. They are experienced, passionate and vibrant. They make good use of instructional time and inspire students to want to learn and to do their best. Our teachers make students feel comfortable and help them experience a sense of belonging. Our goal is to see the clear outworking of God’s character in our students as they LEARN and GROW in GOD. Teaching methods are geared towards offering each child a quality education. Teachers participate in regular professional development and the school has participated in a number of government initiatives that support children to achieve in all aspects of their education, in particular, literacy and numeracy. 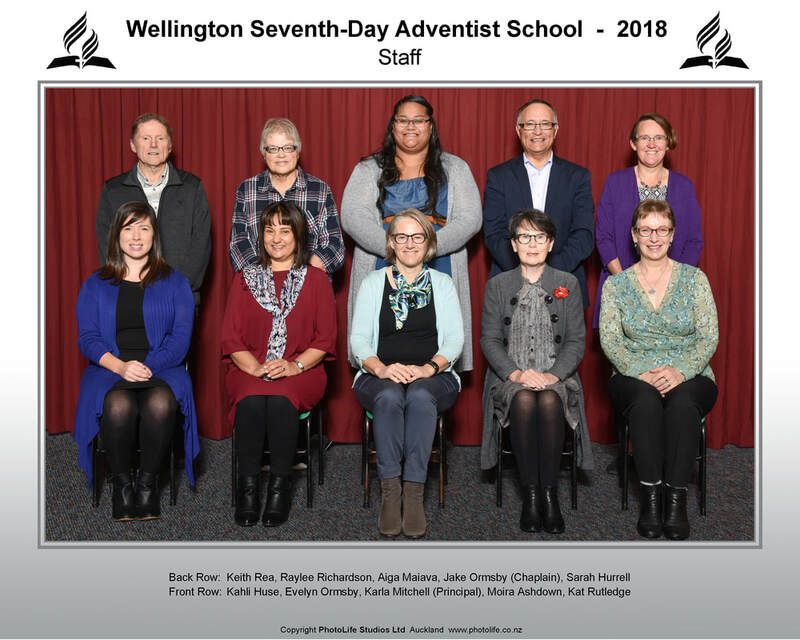 Kia ora, Wellington Seventh-day Adventist School has a special place in my heart. I moved to Porirua from Northland to teach here in 2011. I spent a short time at another school as a Maths Support Teacher (MST) before returning to teach at Wellington SDA School. I began my role as principal in 2017 and am excited to be working with passionate Christian staff, a caring school community, and incredible students. As a teaching principal, I spend the equivalent of two days each week working with students. This year I am the Reading Recovery Teacher. I work with individual six-year old students to support their literacy learning. As a new Reading Recovery Teacher, I spend one afternoon each fortnight training with other local teachers. All students and their families are valued at our school. We have high expectations and believe in working collaboratively with whānau and community to achieve our goals. Existing and prospective families are invited to visit at any time. We look forward to welcoming you to our school. Teaching is an absolute passion of mine and I am excited to work with your child this year in Room 1. I have spent a few years of teaching in Samoa and American Samoa, then in 2013 -2015 I taught at South Auckland Seventh-day Adventist School as a New Entrants teacher. I am beyond blessed to be teaching in a Christian school where we can teach our students about the Bible and the love of God through songs and prayer. There is always satisfaction somewhere if you choose to become a teacher and for me, it would be to see my students succeed in the future, it would be to see my students move up a level in Reading, Math and Writing and to know that with God all things are possible. My goal for the year is to create a loving, safe, motivating and FUN learning environment for my students as they continue to learn new skills and new things every day, but most importantly, it is to have Jesus be the centre of everything that we do. Kia ora, I teach in Room 2 which is made up of Years 2, 3 and 4. I have been teaching for six years now, most of which have been spent with the junior school. I began teaching in the Palmerston North Adventist Christian School and was there for three years. I have recently returned from teaching in London for two years in a secular school. It is truly a blessing and an honour to be teaching children in a Christian school where we can read the Bible and worship through song and prayer. Teaching is a job that cannot be taken lightly, but is made up of moments of awe, fulfillment and joy! Our class has a wide range of abilities and ages, so group work is key. In this way I am better able to meet the individual needs of each child. We will learn a lot through investigation and ‘hands on’ activities. My goal for the year is to create a safe, stimulating and motivating space for my students as they continue to grow closer to God and each other as independent and lifelong learners. It is a privilege to lead a class where Jesus is at the centre of everything we teach. Our vision is Connected to God, Connected to Others and Connected Learners. Hi, I am originally from Urenui, a seaside town in North Taranaki. I have spent a few years teaching in Sydney Australia, helping to get Hills Adventist College set up and running. Most of my teaching has been in Technology in Intermediate and High School level. I am passionate about God and what He continues to do for us, and I want students to use the gifts He has given them to reach their potential. I look for creativity and innovation and encourage students to use higher level thinking where ever possible. My hobbies are music, art, making things, growing things, and water sports like surfing and sailing. I am also interested in the idea of working collaboratively with parents to get the best possible outcomes from their children. Hi, I live in Tawa with my husband Peter. I have three grownup married children and five grandchildren. My youngest daughter came to Wellington SDA for Years 7 and 8 and has fond memories of those two years. I love being fit and active with walking, gym, snorkelling and exploring the world. Reading is also a passion. I have taught twice at the school starting in 1995 and ending in 2006 and now I am back again teaching part time, mainly the senior students, but I also relieve in the two other rooms. I truly value being able to include my relationship with Jesus and His Word in what I teach. I am experienced and strive to keep my pupils engaged, challenged and growing both in general knowledge and in their faith. Integrating as many subjects into one theme is often the way I plan and including an Art focus is something I enjoy. Students enjoy my lessons and tell me often that they are having fun. My teaching career has seen me teach from first year university to preschool - I have qualifications for all these levels. People ask which level I enjoy the most. My answer is the one I am teaching at that moment! The other thing I love about teaching is meeting 'old' pupils and finding out that in some way I have had a positive influence in their lives: there can be no greater privilege.